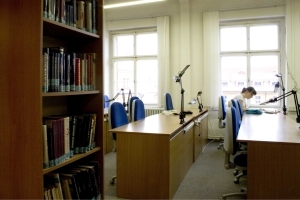 As a specialised institution the Slavonic Library offers its users broad information services in the field of Slavistics. The services provide in-house and remote users a rich palette of direct and indirect resources through the collection as well as electronic information sources. The Slavonic Library also offers scholarly consultation and bibliographic-information services. Registered users can access internet as well as make use of national and international inter-library loan and copy services. In the reading room users have at their disposal twenty thousand volumes in the open-stack and a reference section with three thousand volumes of dictionaries and encyclopaedias. Readers in the lending room can use 120 periodical titles in open-stacks. Upon request, the library staff carries out professional searches.